Tablets can display anything onscreen, from photos and movies to buttons and words. So, it’s only natural that your Windows 8 tablet can toss a convenient keyboard onto the screen when you need to type something. Although a keyboard is the fastest way to enter text, your tablet’s glass keyboard brings a few challenges. First, the keyboard consumes the lower half of the screen, removing half of your work from view. Second, the keys don’t physically move, so you never know if you’ve correctly aligned your fingers. You’ll find yourself staring at the keyboard, rather than focusing on your work above it. On the positive side, each key clicks and lights up when touched, helping you see which one you’ve pressed. And the keyboard autocorrects fairly well; when your fumbling fingers type thw, the keyboard automatically substitutes the. Chances are, you’ll never notice the correction. Also, your tablet’s glass keyboard is often larger than the cramped layouts stuffed onto small laptops. Glass keyboards are always cleaner, too, as they lack the cracks that attract sandwich crumbs and cat hairs. Finally, glass keyboards change characters on-the-fly, easily letting you type symbols and foreign characters once you know a few tricks. Every Windows 8 tablet includes a USB port. If the glass keyboard drives you crazy, plug in a real keyboard snatched from a neighboring computer. To type something on the Windows 8 new Start screen or its apps, you simply tap the area where you’d like to type. As you tap, a keyboard fills the screen’s bottom half, ready for you to begin typing. The desktop isn’t as friendly, unfortunately. When you need to type, you must manually summon the keyboard by tapping the Keyboard icon on the taskbar along the bottom of the screen. 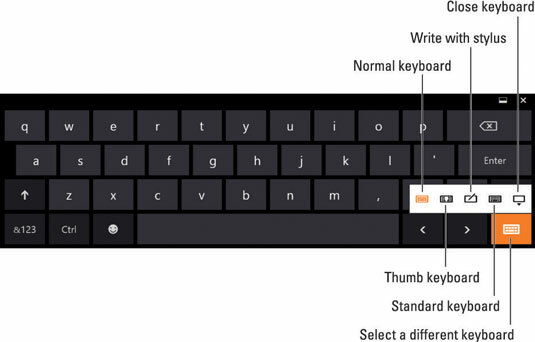 Whether you’re typing from the Start screen or the desktop, the Windows 8 keyboard appears. 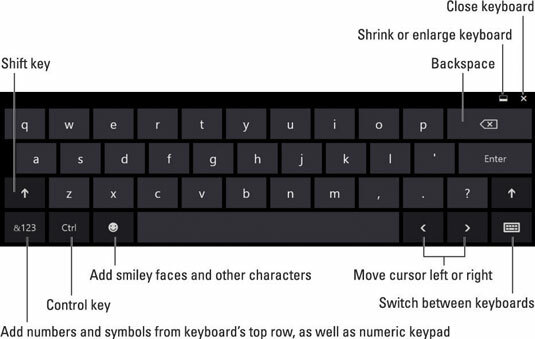 The keyboard looks and behaves much like a real keyboard, with many of the same keys. Position your fingers over the keys the best you can, and start typing. As you type, the letters appear onscreen. Because you can’t feel the keys with your fingertips, you’ll stare at your fingers rather than your work onscreen. Once you grow more comfortable with the keyboard, though, train yourself by shifting your gaze upward, toward your work. Tap the Shift key to type an uppercase letter. (The Shift key automatically turns off after you’ve typed that first letter.) To turn on Shift Lock, tap the Shift key twice. When you’re through typing uppercase letters, tap the Shift key again to turn off Shift Lock. If you’re accustomed to pressing keyboard commands such as Ctrl+V for Paste, press the Ctrl key, and some of the keyboard’s keys will change. The word Paste will appear on the V key, for example. Other keys will sprout labels, as well, letting you know which key you need to press to Select All, Undo, Cut, Copy, or Paste. Need a numeric keypad? Press the &123 key in the lower-left corner, and the numeric keypad appears, along with a Tab key, and the brackets and symbols usually found on most keyboards’ top row. Want a different keyboard? Press the Switch Keyboards button in the keyboard’s lower-right corner to switch between each of the Windows 8 keyboards. When you’re through typing, remove the keyboard from view by pressing the X in the keyboard’s upper-right corner. (Or press the Switch Keyboards button and tap the keyboard icon with the downward-pointing black triangle.) The keyboard vanishes, leaving you with a full-screen view of your work in progress. To switch to the Thumb keyboard, press the Switch Keyboards button in the keyboard’s lower-right corner and choose the Thumb Keyboard option. If the Thumb keyboard is too large for your hands, tap and hold the three dots next to the mini-spacebar on the keyboard’s left side. Three options appear on a sliding bar: Small, Medium, and Large. The Thumb keyboard comes set to Large, so slide over to the Medium or Small option, and see if one of them fits better. Windows 8 also recognizes your handwriting, translating it into text as you write on the screen. However, writing or drawing requires a stylus — a type of pen with a special plastic tip. Some tablets include a stylus; others make you buy one as an option. To switch to drawing mode, tap the Switch Keyboards button in the keyboard’s lower-right corner and tap the Stylus option, shown in the margin. If you need a desktop PC-style keyboard, complete with numbers and function keys across the top, Windows can bring one up. It’s the real deal, complete with the Windows key, the Alt key, and even four arrow keys for navigating menus. The keyboard makes for some mighty cramped typing, though. But it’s nice to have in a pinch, when you need certain keys that aren’t available elsewhere. Adding the Standard Keyboard option doesn’t force you into using that keyboard forever. It’s merely added as an option when you touch the Switch Keyboards button that appears in every keyboard’s lower-right corner.